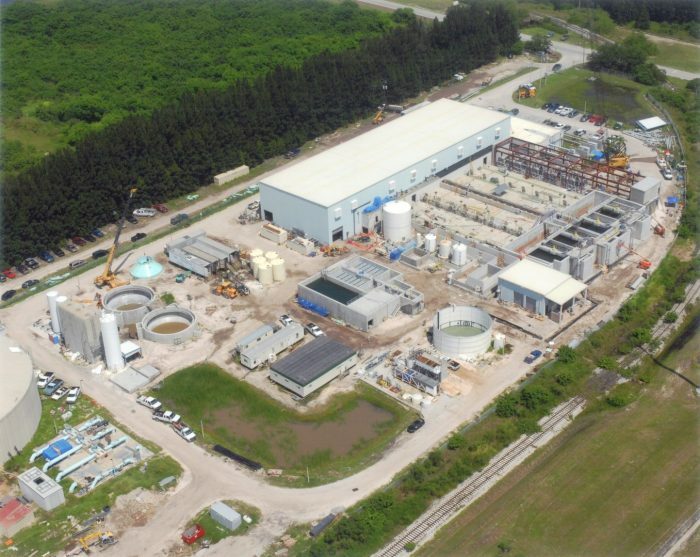 Tampa Bay Seawater Desalination Facility | Wharton Smith, Inc. The Tampa Bay Seawater Desalination Facility is a drought-proof, alternative water supply that provides up to 25 MGD of drinking water to the region. Seawater coming into the plant goes through a rigorous pretreatment process, then fresh water is separated from the seawater using reverse osmosis (RO). The end product is high quality drinking water that supplies up to 10 percent of the region’s needs. This design-build project consisted of a new pretreatment facility, rework of existing Dyna sand filters, addition of a new DE filter area, new chemical area and piping, sludge holding and thickening tanks, lime hardening structures, new RO feed well piping, and an electrical distribution system. Wharton-Smith self-performed the civil, concrete, piping, equipment installation and electrical portions of the project.